Roll out the fondant until thin. Use a round cutter to cut out rounds, making sure that each round is larger than the cupcakes you are using. Use either a small cutter or sharp knife to cut eye holes. Frost the cupcakes with either vanilla or chocolate frosting and place a chocolate marshmallow biscuit on top of each cupcake. 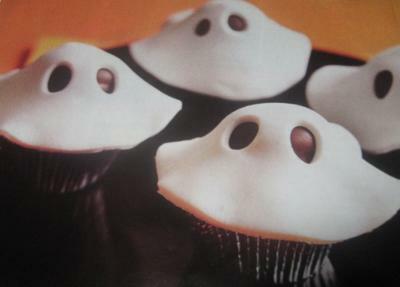 Carefully place the rolled fondant on top and gently smooth so that it has a ghostly look.